About four years ago my wife called me at school and told me that our oldest daughter had gotten off the school bus crying. Walking up our 100 feet of driveway between the road and our door, she had her report card in one hand and was clearly trying to gather herself before getting to the house. She didn’t want her mother to see she was upset, was probably fearing our disappointment with her grades and with her, maybe could imagine an even more high-pressure disciplined approach than what had already been occurring. The year had been pretty rough on her up to that point and we were only a little ways in. Math and foreign language had been incredibly hard on her. She was up late almost every night, often crying but hiding that from us when she could. She had become a hermit in her room from Monday-thru-Friday evenings, trying in vain to reach the standard she thought we had for her and the one she had for herself. She would say she felt dumb (and has shared having felt that in the past), but really-she was a starving student not getting what she needed as an individual. I knew that she was a bright and capable thinker, and her struggles were frustrating to her mother and I as well. From before the time she was a preschooler I had seen the development in her ability to express and describe her thinking in ways that went beyond her years-probably because that is the way I talk to my children (and to my students). She has a somewhat worldly and semi-wild sensibility (in a salty-but-not-nasty way). Introspective, a little nuts, sometimes inappropriate…but always kind; a thoughtful old soul in a young person’s body. And a good student- one of only two in her class that had scored a “four” on the 8th grade NYS ELA state test…yet here she was suddenly struggling in some isolated areas that seemed vital (at the time) to her graduating and eventually getting into college. You would not guess she had a learning disability, or assume she has an IEP, but that’s because she isn’t the globally challenged student often thought of as “special-ed” by many. She has a specific learning disability-demonstrating a noteworthy discrepancy between I.Q. and achievement. While testing done during her evaluation showed an IQ over 120 in areas of strength (language), she showed average or a little under in other areas and had “hit a wall” with Spanish and algebra in terms of performance. Looking over things she had written as a youngster (letter and sound reversals, quirky phonetic spellings…) and recalling how she had difficulties in the early years, we could’ve been on top of it all a little sooner-I mean, she was actually trying to sound out “the” when she read out loud in second grade! The teacher in me should have been concerned, but the Dad in me probably put the blinders on. When your bright and well-behaved child is swimming in a notoriously disruptive cohort, and teachers are grateful to have them- their struggles can go unnoticed. When you are a parent of a child who writes and tells stories, interacts in a comfortable, conversational way, is well behaved and thoughtful, does well in school overall…”learning disability” doesn’t leap onto your radar. On top of that, the kids-are-numbers fixation and “school reform means blame teachers for everything” tsunami had begun its approach. So my wife and I started to execute true “choice” and parental rights. I knew that regardless of how well my daughters had done on state tests in the past, and how well they would probably do, I was not about to sell the labor of my children to benefit misguided reform and testing corporations. That was likely more the “Dad” in me, setting an example for non-compliance with immoral and dangerous orders. I think the reform-through-test/blame/shame model, pushed out at our neediest students as some sort of opportunities-solution, is just that. Immoral, dangerous, diversionary…I could go on, have in the past, and will again in a different bit of writing. But I’m guessing that for desperate parents forced into needing test scores for their children to escape their under-supported schools in densely populated urban neighborhoods and get into some selective school, and for the edu-reform minions of billionaires and the politicians they choose: those test scores are all-important. They are presented as either 1) the ticket away into a “choice” school, and for those previously mentioned big-shots 2) a validation of the catch-22 of subjugate-test-and slander that became the popular M.O. in traditional school and union attacks. In other words, the propaganda pushed the message that good test scores mean good school/effective teachers. At a time when common core and Race To The Top in New York meant more rigorous standards, more difficult tests, during an era of increasing poverty/family struggles/student needs: the bad test scores meant “proof” that schools are failing and education reform is desperately needed, and the sorta-Democrat governor was more than happy to participate in this misdirection. But back to my daughter. I have a tendency to take the long way home when I’m story-telling. That is kind of teacher-ish…but it definitely my Dad-style. There was no way my wife and I were going to let school beat our girl. There was no way I was going to watch my fearless, creative, beautiful daughter be broken by the restrictions of non-responsive curriculum, non-teaching state-level morons or test-worshiping reformers. Surely there were options in state regulations that provided for alternative pathways that could help her navigate towards not just the future-but instead her future. The one that was best for her. And it turns out those alternatives did exist! The frustration came, though, when we tried to pursue those alternatives. We found that state and regional level entities seem to exist mostly to validate their own self worth, but rarely live up to their own hype. Instead of a rehash, I want to say that through our advocacy, and along with the support of our local, democratically run, union-teacher staffed traditional-community-school: our daughter is achieving great things. I understand that some schools struggle to achieve better test scores, and I do see value in well designed asessment used to inform instruction (not pass judgement), but there needs to be a better understanding regarding how we publicly appraise the mission handed to all schools and the outcomes expected from them. She has won recognition in U.S. Northeast region for her art and writing, and has won at the national level last year for her writing. She became the first student representative member of our school’s Board of Education a couple months ago. I have been told that they had my daughter in mind when the thought of adding this position. She was accepted at her first choice college. She applied early admission, committing to the college she wanted most. and waited on pins and needles until Thanksgiving break when she got the news. As a teacher, I use this strategically because I want the brave and most capable to model it- but I want mostly for the super-shy ones to develop some courage and willingness to step-up and speak up. Everyone deserves that chance and I want them to feel the result of feeling right, being right, and being brave enough to say so. Yes, “wrong” happens, but with properly laid foundations, will well designed instruction, and with encouragement that triggers effective thinking- “Yes Mr. McConnell, I am sure!” will happen more often. 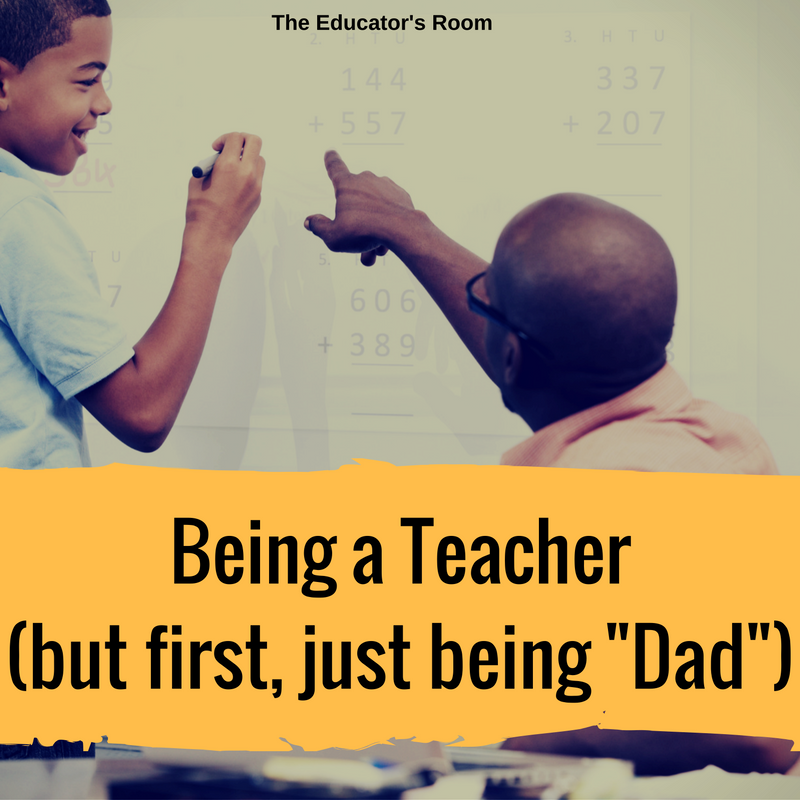 Should I attribute by daughters’ perseverance, confidence, creativity, talent, accomplishments and academic success to the school and its highly-qualified teachers, to my wife and I, or to some combination of the two? If you say a combination of the two, what would you say the school/parent relationship is in the shared-accountability equation: 60/40; 50/50; 40/60? Something else? If my wife and I were less supportive of our daughters’ academic/social readiness or able to advocate in a powerful way for them, would the school’s burden for creating positive outcomes be greater and would outcomes be more likely to suffer? Are there students who receive less guidance, support, involvement and resources from the home and require even greater levels of effort/support/remediation in school? I did not grow up with much at all, so I wonder what it is that leads to better outcomes. I lived with my single mother and two brothers, and we were probably “poor”, but I never really thought of it that way, and didn’t know any other way but to get by getting up before school to go to the babysitter’s when it was still dark; going to the babysitter after school; having chipped beef on toast for dinner; doing my homework at night, sometimes waiting at the diner for Mom to get done, behaving in school during the day… I’m not sure bad news ever came home from school. So is my “good fortune” today all that because my teachers were supper effective and my schools were non-failing (I switched schools a few times)? My guess is that it was, and is something different. While our leaders are desperate to find schools and teachers to blame for eroding opportunities and economic stability for poor families-the achievement gap is concerning, but the real gap is an integrity gap. My family rocked, and they made it about integrity. Regarding my daughters, I hope it’s about integrity for them. I hope we have provided them models, and I know their school has provided them the format in which to achieve, and from their it’s all about them and how they decide to use what they’ve been given.